The FROTH project is a close collaboration between five universities (Plymouth University - PU, University of Oxford, The Manchester Metropolitan University - MMU, City University London - City and University of Bath - UoB) working together to combine and apply their expertise to different aspects of the problem. The aim is to investigate the physics of hydrodynamic impact loading through a carefully integrated programme of numerical modelling and physical experiments at large scale. Open source numerical code will be developed to simulate the experiments to be carried out in the new national wave and current facility at the PU. The experiments are designed to investigate the influences described above and target three groups of experiments, namely: the impact of a falling block on aerated fluid; multi-directional wave impact with a floating block; wave impact with a rigid and elastic wall. Each of the experiments will be reproduced using the numerical codes, for comparisons, validation and detailed further investigation of the specific cases. The numerical model will be built and thoroughly benchmarked within the common platform of the open-source Open FOAM framework, with specific modules addressing the detailed physics of the problem. Linkage of the Open FOAM modules will deliver a complete flow model suitable for violent wave impacts at fixed or moving structures. The wave approach to the structure will be modelled with the fully nonlinear potential flow (FNPF) solver from WP3, the local fluid-structure interaction including aeration, compressibility and hydroelasticity will be developed in WP2, 4 and 5. The RAs will work closely together to define the linkages between the modules at relevant computational boundaries along similar lines to those previously reported. 1. 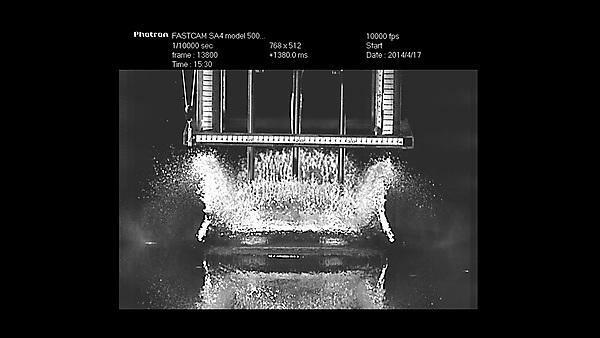 Investigate the role of aeration in hydrodynamic impact loading. 2. Investigate the effect of hydroelasticity during hydrodynamic impact. 3. Investigate the effect of directionality of local wave impact for a floating structure (short crested oblique waves, multiple directional wave groups and their induced motion and loads). 4. Characterise wave impact pressure for a series of wave structure interaction experiments with increasing wave steepness and investigate reliability of wave impact pressure prediction and limits of variability. 5. Make recommendations to improve empirical formula for practical design purposes. 6. Build a modular open source numerical tool to investigate all aspects of the problem.